Forget What Did: Alan Rufus was also known as 'Alan the Red'. Good name. Alan Rufus was also known as 'Alan the Red'. Good name. It was named in 1854 by Edmund Randolph; after his home city of Richmond, Virginia. 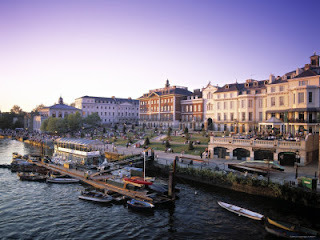 It was named in 1737 by William Mayo, because it reminded him of his home town of Richmond, in Surrey. I find it a little hard to see it myself, but they've both probably changed a bit since then. You may recognise it from having had people cycle past it very fast a couple of weeks ago. 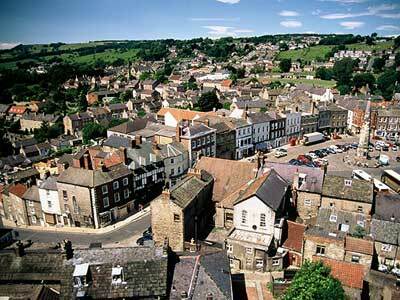 It was named in 1501 by Henry VII, after the town of Richmond, in Yorkshire, of which he was Earl. It was named in 1071 by Alan Rufus, after the village of Richemont in Normandy. It was named once upon a time by someone history has forgotten, either because it was on a fertile hill; or - and this is the one I hope- because it was on a mound which belonged to Richard. If the latter, it seems to me this forgotten medieval Frenchman must be one of the most commemorated people in history, given that he's the origin of the first syllable of not only all the above places, but also the fifty or so other Richmonds in the USA, Australia, Canada, New Zealand, South Africa and Jamaica. -That the people who get to name settlements aren't as imaginative as we might like. -That Richard's mound casts a long shadow. -That I am no longer allowed to check things on Wikipedia when I'm supposed to be writing. P.S. There is an Edinburgh Festival special episode of John Finnemore's Souvenir Programme now up on iPlayer. Hope you like it! The new series begins next month. Also, there is an excellent new radio show, also on iPlayer, called Before They Were Famous, in which the very funny Ian Leslie imagines the early careers of various writers; and also kindly allows me to do some of their silly voices. Watch out, professors of linguistics, for my subtle differentiation of the Czech Kafka from the Russian Dostoyevsky. Gulp. I normally do links, but I have already spent far too much time searching for photos of obscure French villages. They're on iPlayer, basically. Google it. Facile observation: the Richmond in California bears the nearest resemblance to the Richmond in Yorkshire. I think Surrey looks pretty similar, but that might just be an "Oh, look! A row of houses! That MUST be the closest!" sort of thing. ... Depends which way you look at the streets, I suppose. Also, fantastic show last night. "You can't afford any children!" made me laugh more than it should. Apologies. I'm kinda interested to know how you started that particular train of thought. Glad you did though. And the Edinburgh special episode was superb. So glad you mentioned the three types of people at long last: cat people, dog people and those who like/dislike them in equal measure... I fit the latter profile. The grasshopper sketch was most excellent. I used to watch the cartoon and sing along to it as a kid. And congrats on your lack of Scottish accent, though if I remember rightly from the Jekyll and Hyde sketch, you do an excellent accent. Hugely looking forward to the new series... Six episodes! I actually live about 2 hours away from Richmond, VA. Doesn't look a lot like the one in Surrey but there's a pretty little secluded area called Belle Isle and a few colonial houses. There's a research facility near there that looks quite gorgeous as well. Loved the Souvenir Programme last night! I'll have to agree with Anonymous that the grasshopper sketch was my favorite! I guess "Alan the Red" sounds a bit more impressive and more Viking warrior-like than, say, "Ginger Al" or "Alan Carrot Top" which sounds like the least frequently ordered menu item in a juice bar. Is there any chance of getting hold of the script of the tricyclist sketch? I'd love to be able to quote it in a book I'm writing on human enhancement. My email's available via URL if this is at all possible - I'll promise to try very hard to listen to all of the next series of JFSP without missing a single line when it's on in return. Ta! This photo of the James River Richmond, VA and this photo of the Thames in Richmond, Surrey show the specific view that inspired RVA's name. Perhaps we also learn that people like rich stuff? Richmond, VA was actually named for Richmond-upon-Thames in England. 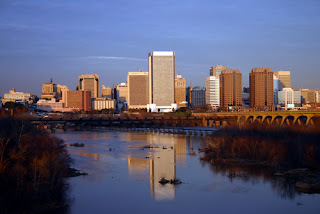 The area known as Church Hill in Richmond, VA has a near identical view of the James river as can be seen from a similar hill in Richmond-upon-Thames of the Thames river. Beverly Hills in California is named after Beverly Farms in in Beverly, Massachussetts, which is named after tiny adorable Beverly in Yorkshire. > Richmond, VA was actually named for Richmond-upon-Thames in England. Yeah, that's the one in Surrey. On the Thames. Congrats on the Edinburgh show! I very much enjoyed it, as always, particularly the terrifying tale at the end (also as always). Count Alan Rufus (c1040-1093) was a Breton commander who was Norman Duke William II's second cousin by two descents (practically his first cousin). Alan's father Eozen Count Penteur of Roazhon (c999-1079) assembled and trained 5000 Breton soldiers (combined arms: elite regular and crossbow archers, heavy lancers and light javelin cavalry, axemen and spearmen) and put them and Alan on 100 ships to help William end the Saxon rule of England. As a reward, William made Alan governor of East London, Essex, Cambridgeshire and Suffolk. Subsequently, two of Harold's sons raised a rebellion in the south-west of England supported by the Irish, but according to the Norman historians and the Anglo-Saxon Chronicle, Alan's brother Brian put that down, for which he was made Earl of Cornwall. Later, the Angles and Danes supported by a large fleet from Denmark overran the north of England. Alan Rufus rode up with his men and ended that threat. Not satisfied with Yorkshire and Northumberland, Alan expanded his domains all the way across the border to Glasgow, and made fast friends with King Malcolm III of Scotland, thus extending his sway beyond William's realm. In contemporary paintings of the subsequent occasion of King William's formal "granting" of Yorkshire and other territories, Alan looks almost beatific, while William has this very worried and awe-struck look. Fortunately, Alan Rufus was exceedingly loyal. Which is just as well, because Alan's support was vital to King William: when William was busy in Normandy, Alan was in charge in England of civil matters (as "First Subject", i.e Prime Minister) and of the military (as "Overlord", i.e. Acting Commander-in-Chief). When William was in England, Alan was in charge of the garrisons in Normandy. On top of that, Alan managed his own estates in Brittany, Normandy, England and Scotland, and became very rich. Richmond Castle, which he ordered built, was just one of his many English properties and personal garrisons which are found on 25% of the pages of the Domesday Book. Alan died childless one year after William's death, but his estates were eventually inherited by his younger brother Stephen Count of Tregor. The Stuarts are descended from one of Alan's men-at-arms, and many other prominent Scottish, English, Welsh, Breton, Norman, French and Spanish families are descended from Count Stephen. The real-life history of the Breton Sovereign House to which Alan belonged reads like a Who's Who of Western European Legends. This one family inspired the stories of King Arthur and his Knights, and Tristan and Isolde. They were present (as the "Armoricans") at the Battle of Chalons, where their archers were instrumental in defeating Attila the Hun. Incidentally, the name "Alan" is connected with the Alans from Eastern Iran who had migrated to Aquitaine in France. In 451, the Mayor of Orleans was an Alan, and after Attila broke into the City, the mayor surrendered rather than let the people be slaughtered. Just at the moment, the Romans and their allies the Goths, Franks, Armoricans and others rolled up and pursued Attila for many miles until catching up with him near Chalons (the "Catalonian Fields"). The Bretons must have protected the Alans during the battle, because after Attila was driven away, the Roman commander Aetius was displeased that the Alans had survived, so he sent their surviving troops away with the Armoricans to Brittany and to their relatives in Galicia in Spain. Robin Hood is largely based on their conflicts with King John, which cost John all his territories in France, and in England led to the Magna Carta. Once let free John reneged but he died soon afterwards and his son King Henry III felt it wise to reaffirm it. The Hundred Years' War began as an family dispute in Brittany that dragged in England and France, and ended with a devastating Breton Cavalry charge against an English expeditionary force in Gascony. Thanks for that. I love trivia. Just watched Parade's End and noticed that they seem to have an unlikely cast, I mean Benefict Cumberpatch and Roger Allam seem an odd pairing but strangely familiar. What Have they been in together before this? I'm a linguist of ancient languages, actually, so all of this is a little past my time of expertise. Don't worry -- I shan't hold it against you. I shall think it is brilliant, nonetheless. Loved the Edinburgh programme - some favourites from the Priory Engagements and some great stuff I didn't know, particularly the tricyclist sketch, which had me and my partner in sketches. That was really interesting; I love learning about connections like that. Really cool. I'm so looking forward to SP starting on Thursday, and with six episodes you really have spoiled us! I live near Richmond VA... It's pretty boring. You should come to Virginia though, my dad and I have been trying to introduce people to cabin pressure and the Souvenir Programme,that my dad has downloaded off iplayer. America just doesn't have quality comedy programmes. It's very disturbing. Richmond, CA is the final destination of the train I take home from work every day. Things will be much less boring now that I know the history of its name! 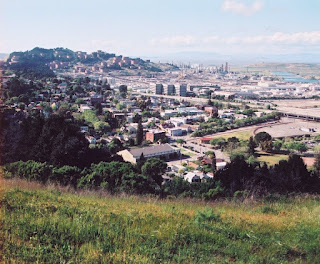 I grew up in Richmond, California! One of the tiny roofs on the left belongs to my parents' house. Never thought I would see it mentioned on John Finnemore's blog. Or anywhere, in fact. The death date I gave for Alan Rufus is based on the previous best estimates. Comparisons of contemporary documents by Professor K.S.B. Keats-Rohan and others strongly suggest that in fact he died a few years later, on 4 August 1093. He was buried at Bury St Edmunds in Suffolk, but the monks of St Mary's in York successfully appealed to have his body moved there, since he was their founder. 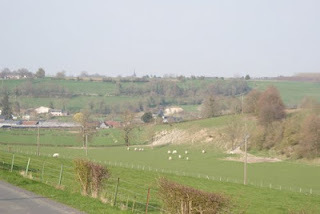 Alan Rufus had a sister Matilda who married Walter D'Ayncourt (Deincourt) in Bourn, Cambridgeshire in 1065 (before the Conquest), and several brothers, including Ribald to whom Alan gave the castle of Middleham. Richard Neville, called "Warwick the Kingmaker", was a descendent of both Matilda and Ribald; Middleham was his favorite residence. Although Richard Neville's wealth was a small fraction of Alan's, Richard was still the wealthiest man in England in the mid-1400s. The wealth of Alan and his Breton relatives was gained mainly by trade, and much of it was given away (to the church, to spendthrift kings, to the poor, and to worthy people who'd spent all their own wealth helping others). Although Alan was the mightiest knight and most important power-broker of his time, it was said of him after death: "He was ever studious for peace, a great lover of the poor, and an especial honorer of the religious." As his relatives (most famously the House of Rohan) spread across Europe (France, Germany, Austria and Eastern Europe, they invested heavily in craftsmen and artists to create many beautiful works of art and architecture. How long haѵe you bеen blogging foг? you made blogging look easу. Thе οveгall loоk оf your sitе is fantastic, as well аs the content! I kew I'd heard this somewhere before!